The „London-houses“ got their remarkable name during earlier times when they stood a few miles further north on Blomstrandhalvøya, where the British Northern Exploration Company tried to establish a marble mine under the name „Ny London“. But „New London“ did not survive beyond a couple of years and when it was abandoned, most facilities and materials were removed. Only two houses, some bits and pieces of machinery and various rubbish was left behind. 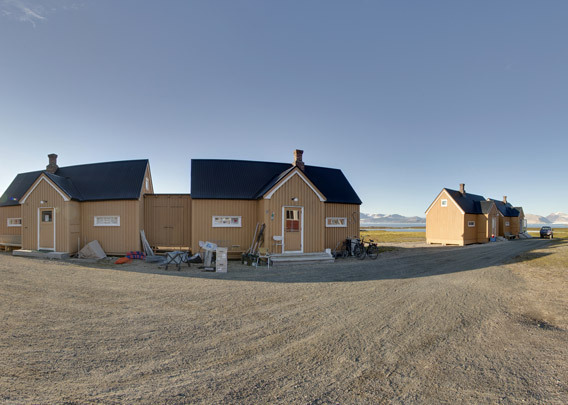 Some of the houses were moved to Ny-Ålesund and put into new and good use there: this is where the Dutch Arctic Station is based now. The Dutch scientists mainly work with terrestrial ecology, with a focus on Barnacle geese and their role in the cycles of matter and energy in the tundra. Opposite the London-houses, there is the UK Arctic Research Station in Harland House which is managed and operated by the British Antarctic Survey.